Adorned with tiny red & white heart charms and beads ... Greeting Card size measures 4 1/2 x 6 1/8 ... includes a red envelope within a clear bag. inside message ... " Happy Valentine's Day "
Adorned with a scrarecrow charm and red heasrt ... Greeting Card size measures 4 1/2 x 6 1/8 ... includes a red envelope within a clear bag. 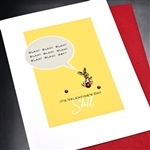 inside message ... " You, Happy Valentine's Day "
Adorned with spaceman, Saturn charms and crystals ... Greeting Card size measures 4 1/2 x 6 1/8 ... includes a red envelope within a clear bag. inside message ... " Hope Your Valentine's Day Is Out Of This World "
Adorned with a turtle charm and pearls ... Greeting Card size measures 4 1/2 x 6 1/8 ... includes a turquoise envelope within a clear bag. Adorned with a cat charm and beads ... Greeting Card size measures 4 1/2 x 6 1/8 ... includes a red envelope within a clear bag. Adorned with a gun & red heart charm ... Greeting Card size measures 4 1/2 x 6 1/8 ... includes a red envelope within a clear bag. Adorned with a metal tiny bee charm and beads ... Greeting Card size measures 4 1/2 x 6 1/8 ... includes a red envelope within a clear bag. Adorned with a metal Saturn charm and crystals ... Greeting Card size measures 4 1/2 x 6 1/8 ... includes a red envelope within a clear bag. inside message ... " Happy Valentine's Day, Mom "
Adorned with a metal bull dog charm and red heart ... Greeting Card size measures 4 1/2 x 6 1/8 ... includes a red envelope within a clear bag. Adorned with 2 metal dog charms ... Greeting Card size measures 4 1/2 x 6 1/8 ... includes a red envelope within a clear bag. Adorned with a metal race car charm, red heart charm and beads ... Greeting Card size measures 4 1/2 x 6 1/8 ... includes a red envelope within a clear bag. Adorned with a metal dog charm and beads ... Greeting Card size measures 4 1/2 x 6 1/8 ... includes a red envelope within a clear bag. Adorned with metal dog and star charms and beads ... Greeting Card size measures 4 1/2 x 6 1/8 ... includes a red envelope within a clear bag. Adorned with a dog charm and beads ... Greeting Card size measures 4 1/2 x 6 1/8 ... includes a red envelope within a clear bag. Adorned with a metal Saturn charm and beads ... Greeting Card size measures 4 1/2 x 6 1/8 ... includes a red envelope within a clear bag. Adorned with a metal hummingbird charm and beads ... Greeting Card size measures 4 1/2 x 6 1/8 ... includes a red envelope within a clear bag. Adorned with a metal whale charm and beads ... Greeting Card size measures 4 1/2 x 6 1/8 ... includes a red envelope within a clear bag. Adorned with metal guitar charm ... Greeting Card size measures 4 1/2 x 6 1/8 ... includes a red envelope within a clear bag. Adorned with metal fork & star charms and beads ... Greeting Card size measures 4 1/2 x 6 1/8 ... includes a red envelope within a clear bag. Adorned with a dragon fly charm and beads ... Greeting Card size measures 4 1/2 x 6 1/8 ... includes a red envelope within a clear bag. Adorned with a tiny bee and bee hive and beads ... Greeting Card size measures 4 1/2 x 6 1/8 ... includes a pink envelope within a clear bag. Adorned with a love charm and beads ... Greeting Card size measures 4 1/2 x 6 1/8 ... includes a red envelope within a clear bag. Adorned with elephant & heart charms ... Greeting Card size measures 4 1/2 x 6 1/8 ... includes a red envelope within a clear bag. inside message " Happy Valentine's Day "
Adorned with beads ... Greeting Card size measures 4 1/2 x 6 1/8 ... includes a pink envelope within a clear bag. Adorned with cat & heart charm and beads ... Greeting Card size measures 4 1/2 x 6 1/8 ... includes a red envelope within a clear bag. Adorned with anchor & heart charms and beads ... Greeting Card size measures 4 1/2 x 6 1/8 ... includes a red envelope within a clear bag. Adorned with a bunny charm and crystals ... Greeting Card size measures 4 1/2 x 6 1/8 ... includes a red envelope within a clear bag. Adorned with a metal bicycle charm an beads ... A6 size measures 4 1/2 x 6 1/8 ... includes a red envelope within a clear bag. Adorned with a flamingo charm and beads ... A6 size measures 4 1/2 x 6 1/8 ... includes a red envelope within a clear bag.